Posh striker Luke James was excellent against Rochdale according to his manager. He is pictured here going past Dale's Ashley Eastham. Photo: Joe Dent/theposh.com. Peterborough United manager Darren Ferguson was happy with his side’s display as they beat Rochdale 2-1 at the ABAX Stadium today (February 14). But Ferguson was also irritated that his team are not travelling to League One leaders Bristol City on Tuesday (February 17) in even better form. 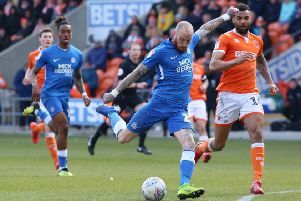 Posh deservedly beat Rochdale by converting the early goal-scoring chances that they missed in their last outing at home to Gillingham (February 10). Harry Beautyman and Christian Burgess scored the Posh goals inside the first seven minutes. Rochdale replied with a screamer from Joe Rafferty midway through the first-half, but they rarely looked like getting back on level terms. Today’s win moved Posh up three places to 10th. They are now just two points outside the play-off places, but face a tough run of games starting at Ashton Gate next week. “We started the game against Rochdale in exactly the same way we started against Gillingham, but this time we took our chances to score. The start won the game for us. We scored twice in a dominant opening spell and could have scored more. “It was frustrating that another team scored against us with their first shot of the match, but we saw the game out quite comfortably in the end. It was a good day for us and a good comeback after the disappointment of the Gillingham match. Ferguson made three changes to his starting line-up today. Erhun Oztumer replaced Marcus Maddison who has a knee injury, while Aaron Mclean took over from Conor Washington as Luke James’ strike partner. Goalkeeper Ben Alwnick returned in place of Scott Loach - Loach has now completed his loan spell and returned to parent club Rotherham. New signing David Norris and attacking midfielder Jon Taylor were left on the substitutes’ bench. Norris came on for his Posh debut in the second-half while Taylor came on for his first bout of competitive football since November 15. Ferguson added: “I was going to play Erhun even if Marcus had been fit. Erhun does find it difficult on our bad pitch, but he showed what he is all about with some great touches and passes. He got tired which is why I took him off and that enabled me to get David Norris on. He is going to offer a lot of experience and composure to our midfield. “I’m still trying to find the right pairing up front, but Aaron gave me a good hour and that meant we could get an important 30 minutes into Jon Taylor. He was rusty, but we will need his energy at Bristol as they have it in abundance. “I felt Harry Beautyman played well again, while Luke James was excellent once more. The only stat missing from Luke’s game is goals. He holds the ball up well, he wins headers and he is working hard. It’s obvious that everyone in the ground is desperate for him to score and his performances of late deserve a goal. Posh follow the City game with a trip to third-placed MK Dons on Saturday (February 21), a home game against ninth-placed Bradford City (February 28) and an away match at fifth-placed Sheffield United (March 3). Left wing-back Joe Newell was taken off at half-time today with a groin problem. He has a chance of being fit for the City game as does Maddison. Ferguson’s replay to the question about possible new recruits next week was ‘wait and see’.